Southern senior Josie Cundiff (13) attempts a two-pointer in front of RVHS senior Jaden Neal (right), during the Lady Tornadoes’ 55-40 victory on Saturday in Racine, Ohio. River Valley senior Carly Gilmore (32) shoots a layup during the Lady Raiders’ 55-40 setback on Saturday in Racine, Ohio. RACINE, Ohio — For a 15 minute stretch, the Lady Tornadoes were absolutely dominant. The Southern girls basketball team went on a 33-to-12 run over the final 10 minutes of the first half and the first five minutes of the second half, leading the Lady Tornadoes to a 55-40 victory over non-conference guest River Valley on Saturday in Meigs County. Southern (3-10) — which snapped its four-game losing skid with the win — never trailed in the contest and led 9-8 six minutes into play. The Lady Tornadoes ended the first quarter with an 8-0 spurt and a 17-8 lead. 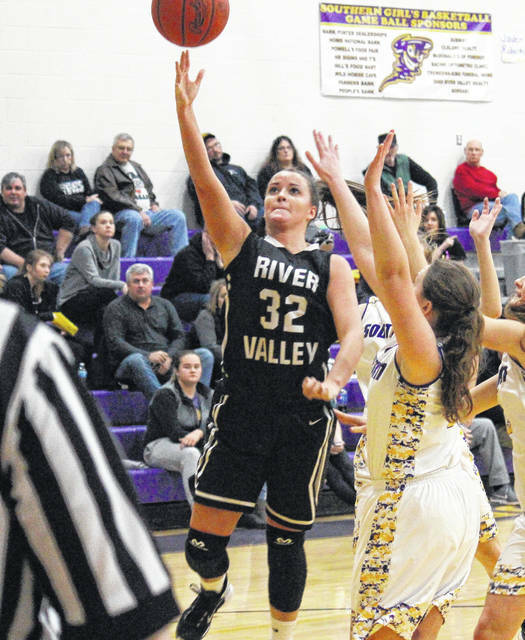 SHS scored four points in the first 40 seconds of the second quarter, but River Valley (0-11) held the hosts scoreless for the next three minutes, trimming the deficit back to single digits at 21-12. The Purple and Gold closed the first half with an 11-6 run, making their advantage 32-18 at the break. Southern scored 10 of the first 12 points in the second half and led by a game-high 21 points, at 41-20, with 3:00 left in the third quarter. The Lady Raiders ended the third on a 9-to-3 spurt and trailed 44-29 with eight minutes to play. In the fourth quarter, the Lady Tornadoes led by as many as 19 points, at 52-33, with five minutes remaining. The Silver and Black outscored SHS by a 7-to-3 clip over the rest of the game, as Southern claimed the 55-40 victory. For the game, Southern shot 19-of-55 (34.5 percent) from the field, while missing all nine of its three-point attempts. River Valley shot 16-of-69 (23.2 percent) from the field, including 1-of-19 (5.3 percent) from beyond the arc. From the free throw line, SHS shot 17-of-31 (54.8 percent) and RVHS shot 7-of-18 (38.9 percent). Both teams pulled in 42 rebounds in the game, with the Lady Raiders winning the offensive glass by a 21-12 tally. Southern claimed advantages of 18-to-16 in steals and 9-to-8 in assists, while recording all-6 of the game’s blocked shots. SHS turned the ball over 31 times, three more than River Valley. 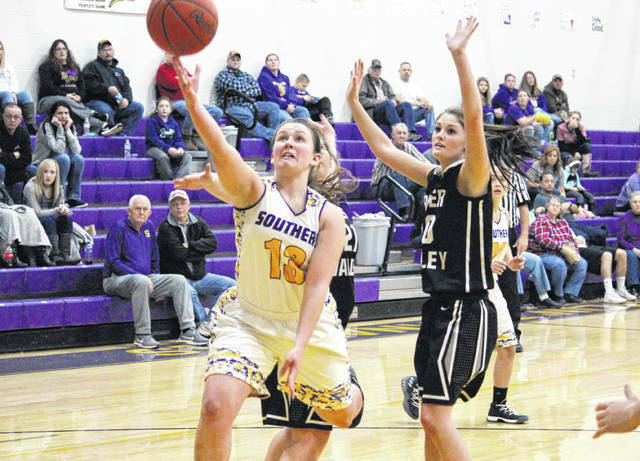 SHS sophomore Baylee Wolfe led the Purple and Gold with a double-double effort of 16 points and 11 rebounds. Phoenix Cleland poured in 11 points in the win, while Jaiden Roberts had 10 points and a team-best three assists. Josie Cundiff scored eight points for the hosts, Lauren Lavender added six points, while Shelbi Dailey and Paige VanMeter had two points apiece. Roberts led the SHS defense with five steals, followed by Dailey with a trio of rejections. 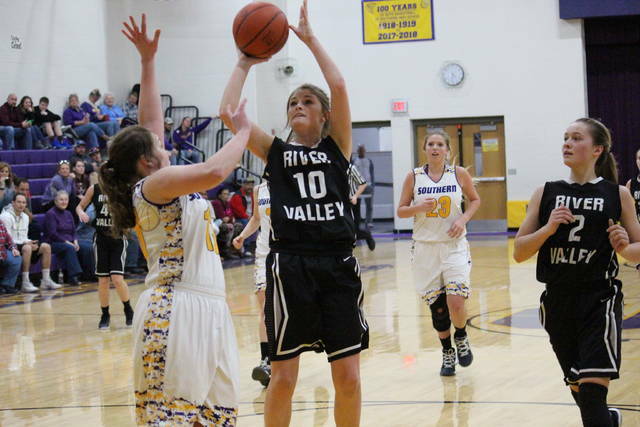 RVHS sophomore Kaylee Gillman led the guests with 10 points, while hitting the game’s only three-pointer. Jaden Neal scored nine in the setback, Hannah Jacks and Carly Gilmore both had eight points, while Kelsey Brown finished with five. Jacks pulled in a game-high 12 rebounds, while Brown dished out a team-best three assists for the Silver and Black. 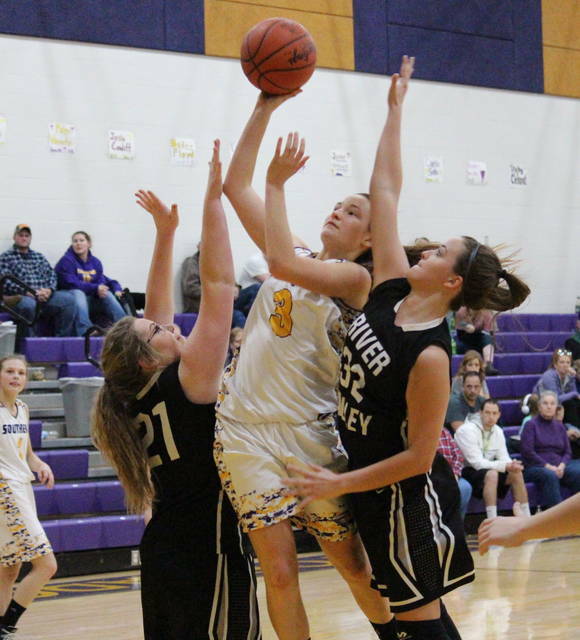 The Lady Raider defense was led by Jacks and Kaylee Gillman with five steals apiece. The Silver and Black are back in action on Wednesday at South Gallia. The Lady Tornadoes continue their homestand on Thursday against Federal Hocking.